Bike shorts don’t leave much to the imagination, but this picture is proof that they’re better than nothing! As part of Saturday’s eighth annual World Naked Bike Ride (WNBR), over 100 Toronto cyclists stripped down and streaked through the city in protest against global oil dependency and the harm automobile pollution poses to cyclists, pedestrians and the environment. And they weren’t alone. The ride took place worldwide, with naked cyclists cruising through 70 cities in 20 countries. I admit, I didn’t catch this year’s ride live. This photo is from 2010, when I’d just stepped out of a Kensington Market shop and was standing on Spadina, conveniently with my camera in hand. Suddenly, these naked cyclists rode by…and of course I couldn’t resist taking a peek, er, I mean pic. This year’s 14 km ride started in scenic Coronation Park, by the lake, and did a loop, hitting major downtown landmarks, including city hall and Kensington. Cyclists were invited to gather together at noon to decorate their bikes and their bodies (body painting is a fun way to be a tad demure). At 1 p.m., riders of all shapes and sizes took off on what I imagine was a liberating albeit uncomfortable ride – for both the cyclists and onlookers! I mean, really, how painful is it to ride a bike in the buff? Apparently, not so painful that Toronto riders were doing so back in 1912, when this photo was taken of naked cyclists riding along the Don River (the original picture is from Toronto City Archives). 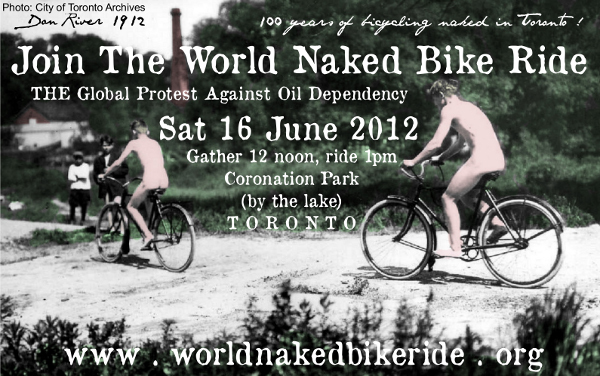 As this year’s WNBR Toronto poster indicates, Toronto cyclists have been riding naked for a hundred years! Who knew? But unlike the gentlemen in the poster, ride participants are asked to wear shoes and a helmet. They’re being models of safe cycling, after all. That, I think, is what’s so amusing about the sight: they’re au naturel but wearing gear! So I ring my bell in solidarity. 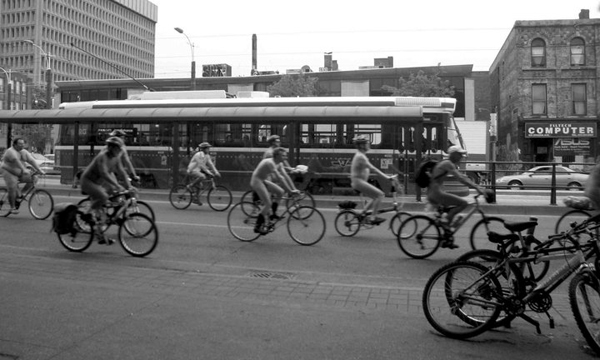 This city needs all the good cycling news it can get, what with our mayor, Rob Ford, wanting to remove bike lanes. While I’m fine riding with traffic (heck, I am traffic), I do appreciate bike lanes and would rather not inhale car exhaust while riding. 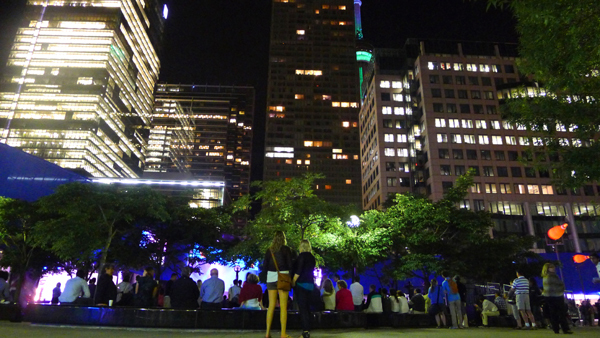 Info is already available for next year’s WNBR Toronto. If you’re keen on participating or you’re curious about the possibilities, visit the group’s Wiki page for deets on the June 15, 2013, event. And remember, sunscreen is a must when all you’re wearing is shoes, socks and a helmet. Talk about cheeky! 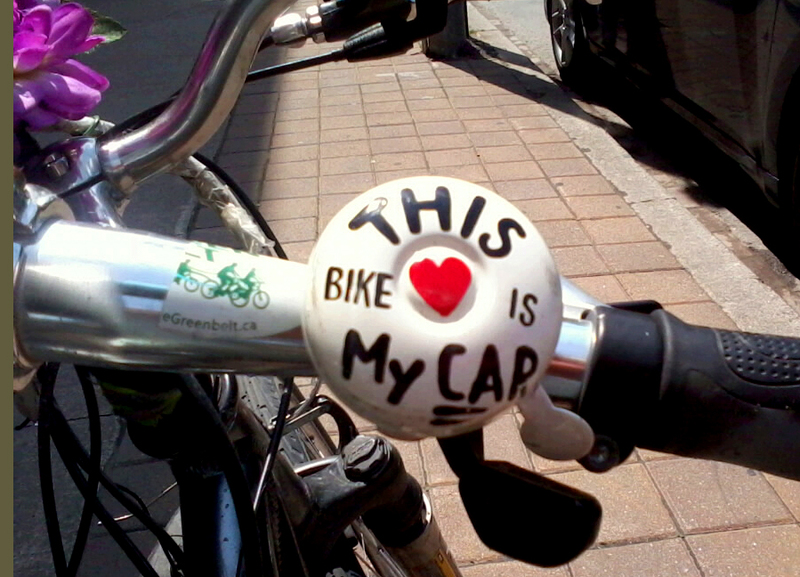 Hands down, this is the coolest bike bell I’ve seen in Toronto! Though I’m still lovin’ my candy apple red Public Federico bike bell and I’ve more bells than I’ve bikes (I kinda collect ’em – bells, that is), I’ve been coveting this This Bike is My Car bell since I spotted it in action last week when I was locking up my bike. So I had to find out where to get it. A quick search led me to Perpetual Kid, a U.S.-based company that sells fun items that appeal to the kid in all of us. Some products verge on novelty (the cheeky emergency moustaches “sealed for freshness” come to mind) while others are pretty and practical (the oh so cute cupcake bandages tickle my fancy). Their bike bells fall in the latter category, and This Bike is My Car is most def my fave, with its green, pro-cycling slogan. And as if I needed another reason to pine for it, each cheap ‘n’ cheerful bell ($15.99 US) is hand-painted with eco-friendly paint! I’m thisclose to buying it. It’s hard to resist, I tell ya. I love the message: that a bike is more than a mode of transportation – it’s a way of life. Ring My Bell: Ciao Bello to My Public Bike Bell, Federico! 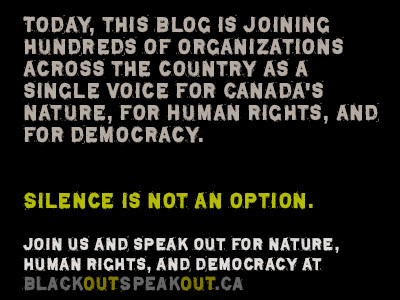 To learn more, visit blackoutspeakout.ca. 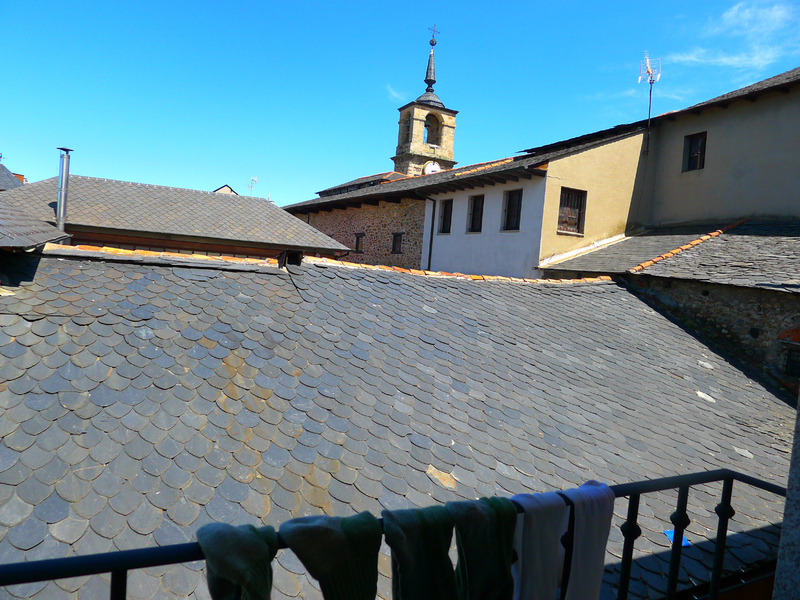 This is Part 2 of my series on albergues I stayed at and where I wish I stayed on the Camino. You can read Part 1 here. 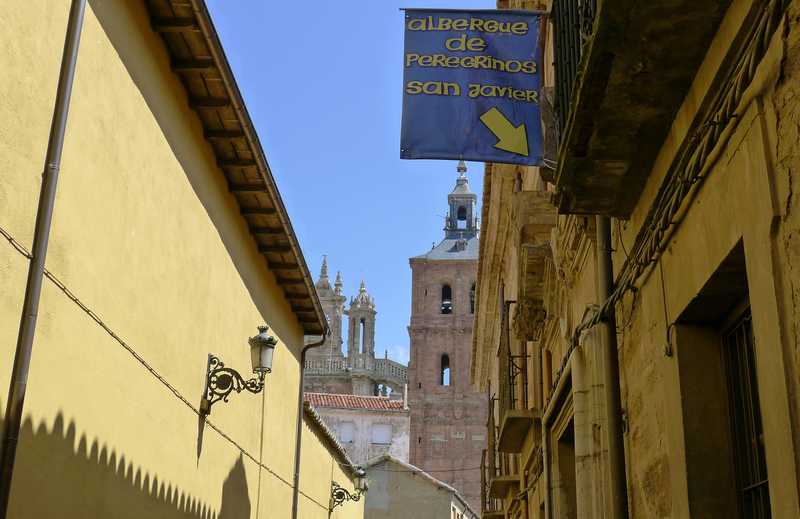 Being a city, Ponferrada had lots of hotel choices but only one albergue, as I noted before. 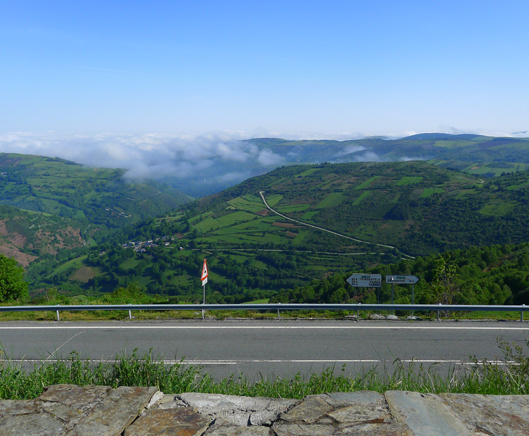 Walking from Ponferrada, you’ll find fields, some scenic and some not so much, and a couple of villages…till you meet the village of Cacabelos. Albergue: Locals call the Albergue de Peregrinos de la Augustina de Cacabelos (Pl. de Santuario) the Old Church, since the albergue was built around the church. Yes, around: the rooms form a ring around the church, with a courtyard in between. As you walk through Cacabelos, you’ll spot the New Church in the centre; follow the road that passes the New Church on the left till you reach a river, where you’ll see the Old Church on the other side. No. of Beds: There are 2 beds per room, for a total of 70 beds, or 35 rooms. Yay! No bunkbeds or dorms!!! Caveat: The rooms’ dividing walls don’t extend to the ceiling, so they’re open to one another at the roofline. If a fellow pilgrim is snoring 3 rooms down, it’ll sound like he (invariably the snorers were men) is in your room. Note: I got the VERY LAST BED! A gent came in a minute after me, and he was given a mattress, which he placed on a stone bench beside the picnic area. That’s what happens when albergues are full – you get a mattress instead of a bed! Blankets: Yes. A must, as those walls were thin and the nights were cold. Washrooms: Modern facilities, with stainless steel sinks and lots of light, 3 shower stalls and 3 toilets (for the women; not sure what the men’s washroom looks like). Maybe it’s because I got there late, went to bed late and woke up late, but I never saw anyone else in the women’s washroom. Kitchen: No, but there’s an outdoor shelter you can picnic under. 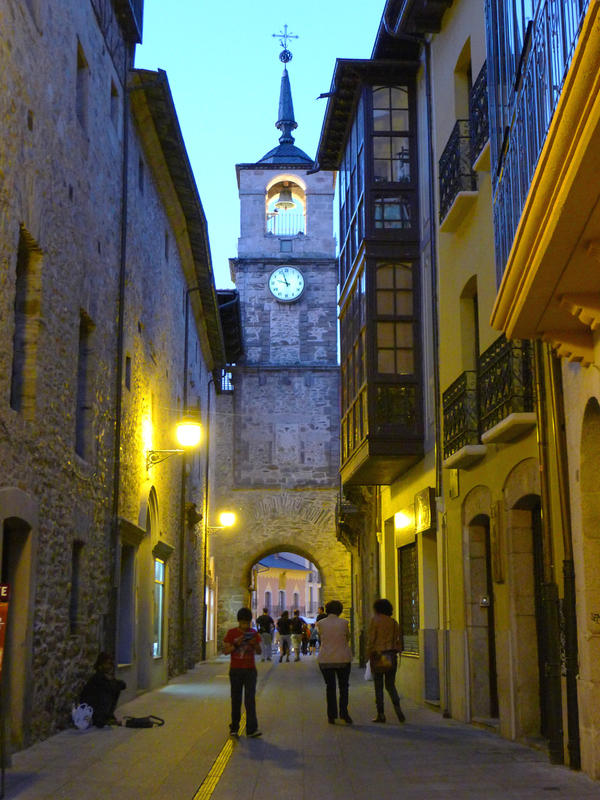 And Cacabelos has lots of restaurants, bars, cafés and bakeries on various streets, so there’s plenty of food to be found. Patio: Yes! It’s all patio! Check out the picture below. Vibe: Old world, green. Loved, loved, loved this albergue. From the outside, you can admire the church’s façade and the charming stone wall encircling it (the wall is the exterior wall for a ring of hostel rooms). Inside, it’s one big courtyard, where you can sit on your doorstep, listening to the rustling leaves, or you can picnic under the outdoor shelter, or you can dry your laundry on the racks. Bonus: Cacabelos has tons of restaurants and bakeries, plus a pharmacy. This was exciting news for me, as my feet were painfully blistered and in need of some Compeed blister bandages and Cristalmina antiseptic spray. Albergue: Painted a sunny yellow, the Albergue Crispeta (tel. 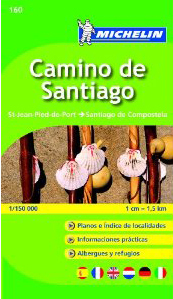 620 329 386; 987 566 529) is across the lumber yard and right on the Camino. No. of beds: 20 (3 dorms, with 3 to 4 bunkbeds in each). The bunkbeds were sturdy and comfy, and the room actually felt warm at night, which was a first for me! None of the albergues are insulated, and the stone walls can make them quite cold overnight, but this one was warm and cosy. Yay! Blankets: Yes! Always a plus. Washrooms: Only 1 for everyone, so y’all gotta take turns! Kitchen: Yes. The kitchen/dining area is big and cosy, with a dining table in the middle. We hung out in the kitchen, eating cherries till the wee hours. OK, OK, we only stayed up chatting until 11 p.m. But to a pilgrim, 11 p.m. is like 3 a.m.! Patio: I’d have enjoyed lounging on the upstairs patio if it hadn’t rained upon us arriving on the doorstep; the street-level patio would make a nice breakfast spot. Vibe: Like home. The small dorms are upstairs while the restaurant is downstairs. The resto was closed by the time we got there (around 5 p.m.). There’s a computer, and the owner kindly installed Skype on it so my friend could make a long-distance call. Bonus: There’s a little grocery store a short walk up the road, and according to my guidebook, there’s a pharmacy. We found a charming vegetarian restaurant/pension that had a large communal table, which had us swapping stories with strangers all night long. Such is the Camino! There are only 2 places to stay in the restored Celtic village of La Faba: The hippie 7-bed Vegetarian Refugio and the 66-bed German-run Albergue de La Faba. 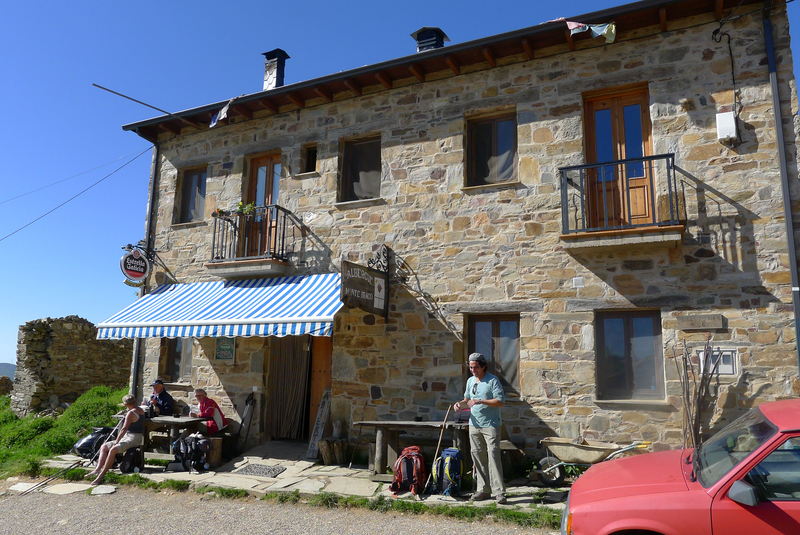 This popular albergue is located on picturesque leafy grounds and is a scenic rest stop if you don’t want to continue the 5.5 kilometre climb up to O’Cebreiro. La Faba is much quainter than O’Cebrerio – you won’t regret staying here. Albergue: The Albergue de La Faba is one of my favourite albergues, simply because the grounds are so scenic. Surrounded by lush trees and offering both sun and shade, this albergue is the perfect place to take an outdoor nap. If you’d rather enjoy the view, you can do that too, as the grounds overlook the footpath. If you’re arriving on foot, the albergue will be one of the first things you see when you reach La Faba (it will be on your right); if you’re arriving on bike, you’ll have taken the road, in which case you will enter the village on the far side and will have to walk your bike here. No. of beds: 66 (spread out over 3 dorms). The main dorm is shown here. There’s a semblance of privacy, as pairs of bunkbeds are divided by half walls. The wood beams and roof add rustic charm. Camping: Yes, camping is possible if you have your own tent. I had lots of fun helping an American set up his Big Agnes Seedhouse 1-person tent next to the church (I used to have the same tent and got a kick out of setting it up in 5 minutes!). Cyclists: Yes, there’s bike storage here. Washrooms: Only 3 showers and 3 toilets (each for men and women). This is the only hostel I stayed in where there was always a line for the facilities. Laundry: There’s a washer, dryer, washbasins and plenty of clotheslines. Kitchen: The kitchen/lounge is spacious and well stocked. Patio: Lots of green space here! I had a relaxing time picnicking on the stone ledge that overlooks the Camino, and could have napped there all day if it hadn’t poured. A few of us waited out the rain outside, sitting on the benches and stone floor under the church’s porch (see below). Vibe: Idyllic. 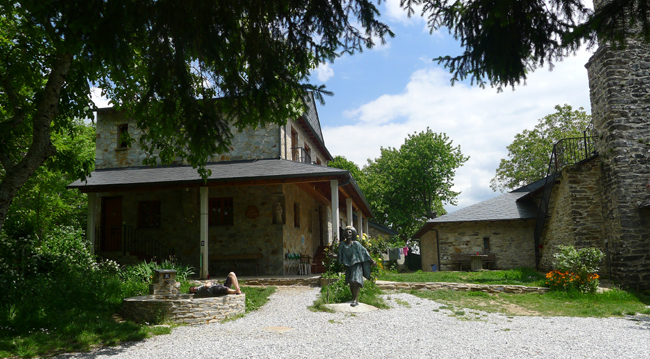 This albergue, originally a 15th-century rectory, is surrounded by trees and overlooks the walking trail. 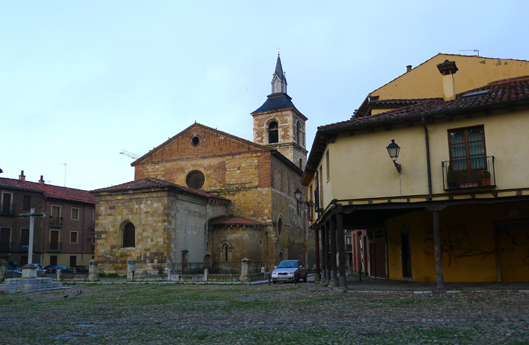 It also has its own little stone church, San Andrés, which dates to 1180. The day I was in La Faba, monks drove down from O’Cebrerio to hold a service where they wash the pilgrims’ feet. Chatting with one of the monks, I learned he’d visited their order in Toronto! Bonus: For a little village, La Faba has enough amenities to satiate hungry pilgrims: 2 restaurants (you have to make a reservation at the Vegetarian Refugio if you want to eat there) and a small grocery store. OK, so I’m cheating with this photo. It’s a pic of the bar, not the 18-bed Albergue de Hospital de la Condesa (tel. 660 396 810; 982 161 336). I stopped at Hospital for a drink, but I figure that a quaint mountain village with a public water trough and a bar with an antique loom in back must have a nice albergue too. 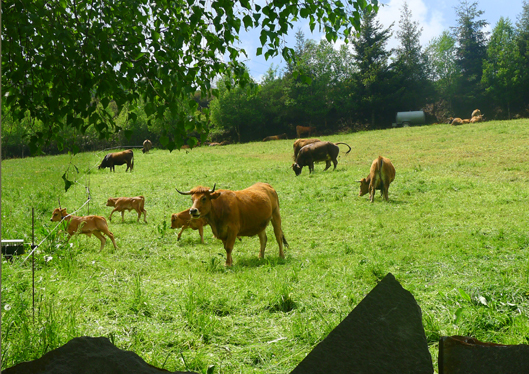 Another village I didn’t stay in, Filloval was just the refugio in the middle of fields galore…and these cows beside the picnic tables next to the refugio. If I’d been on my own, I would have stayed here to enjoy the surrounding countryside. It’s one of those accommodations that weren’t in any of our guidebooks. Albergue: The municipal albergue, Albergue de Triacastela (669 396 811; 982 548 087), is the first thing you see on your left when you exit the woods and approach Triacastela. 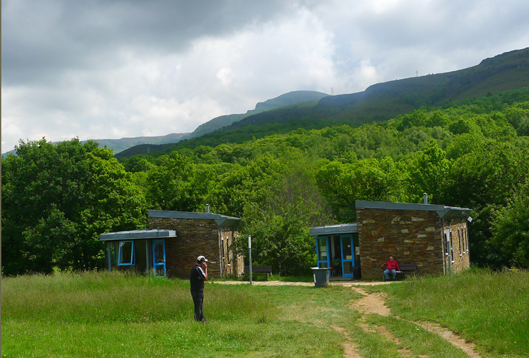 Two buildings in a grassy field overlooking the mountains, the albergue is just outside the village, so you’ve only a short walk to restaurants and grocery stores. No. of beds: 56. There are 2 bunkbeds per room, with the rooms closed off from the hallway by saloon-style swinging half-doors. It’s just enough privacy that you might not hear snoring from the room next door! Washrooms: I don’t know about the men’s washroom, but the women’s had only 2 toilets and 2 showers. As with all the municipal albergues, the showers are Euro style, i.e., they’re open to one another. If you’re modest, these showers aren’t for you. 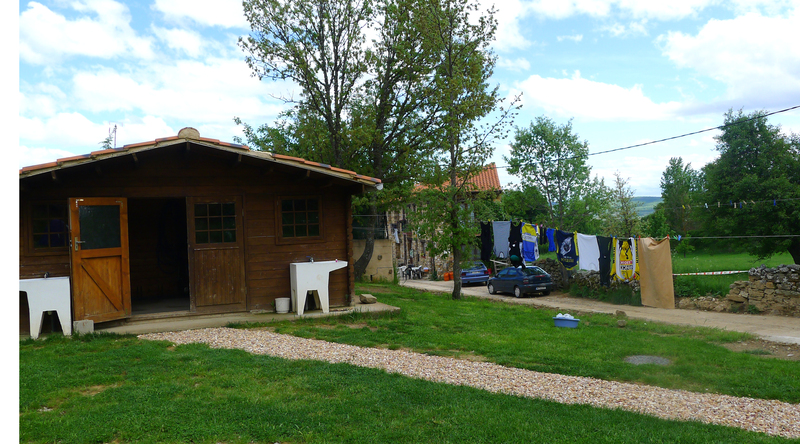 Vibe: Much like the albergue in Riego de Ambros, I found the Triacastela albergue to be rather empty, with a handful of people hanging around out front, line-drying laundry or sitting on the grass. I really liked being surrounded by fields. The view isn’t all that (see photo at right), but I’d rather be amidst fields than be in the centre of town, even a pretty town. Bonus: Triacastela has a pharmacy, so you know I stocked up on more Compeed blister patches. It also has 2 large grocery stores, a bakery, lots of albergues and refugios, plus a few restaurants on the main road and in the Old Town. 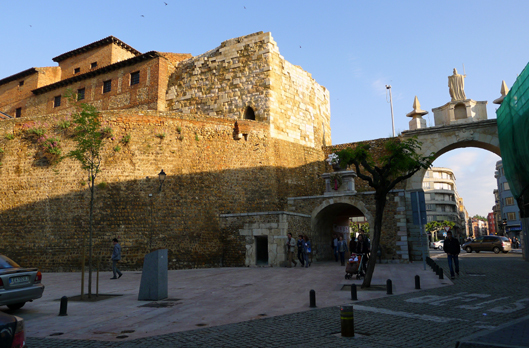 This is the Part 2 of a 5-part series on albergues between León and Santiago. Part 3 is coming up soon! 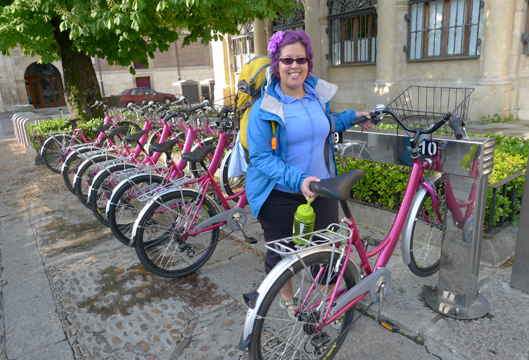 A reader, Laura, recently asked about albergues I’d stayed at between León and Santiago when I walked the Camino last year. I’d advised her that my best accommodation tip would be to make friends with some German pilgrims! It’s true! All of the German pilgrims I met (and there were lots of them!) had the best guidebooks, only available in German, of course, and updated every year, which means they’ve the inside scoop on albergues. The three Germans I walked part of the Way with each had the same yellow guidebook that was pocket size but chockfull of info. My little Michelin book (at left) was only a year old and already out of date, with some of the listed albergues closed, but it was still handy for hostels and especially for distances and altitudes. What I realized walking the Camino is that you need to be flexible, because many lovely little albergues pop up in the middle of nowhere and aren’t in any guidebooks. 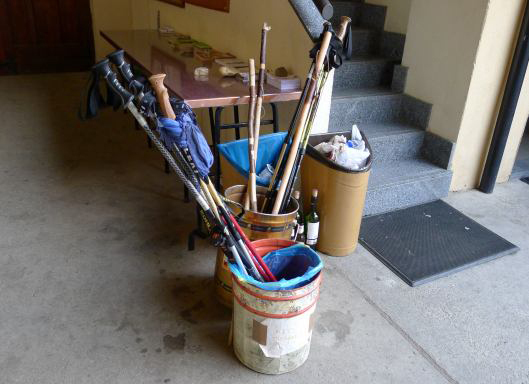 While others in the books, even in those beloved yellow German Camino guidebooks, are no more. So here’s where I stayed and where I wish I’d stayed on the Way. Albergue: The Nuns’ Hostel, a.k.a. Albergue del Monasterio des las Benedictinas, or Santa Maria de Carbajal (Plaza Santa María del Camino). No. of Beds: Approx. 56 beds. 2 sparse dorms, housing about 14 bunkbeds in each. Washrooms: A few showerstalls (with curtains), toilets and sinks. Separate for men and women. Vibe: Austere. It is a hostel in a convent, after all, run by the Benedictine Sisters. There’s a small patio with a few tables in the tiny courtyard near the entry, and a larger dining area above the dorms. I never went to the main dining area, so I’m not sure if there’s a kitchen; I suppose there’s one, however, because my friend had yogurt stashed in there. Curfew: 9:30 p.m., a half hour before most albergues. Keep in mind that León only starts to come to life at that time, so if you want to enjoy the nightlife, a hotel would be a better choice. Bonus: If you’re so inclined, you can join the nuns for mass or vespers. Remember to withdraw cash from an ATM here, because you won’t find another ATM till Ponferrada (Molinesca may have one, but I didn’t notice). 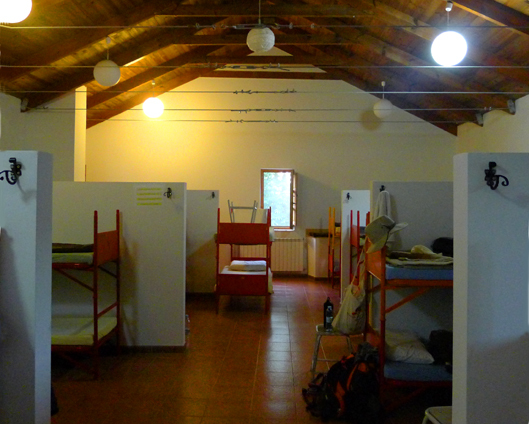 Albergue: As you can tell from the pic, Albergue de Peregrinos San Javier (Calle Portería 6; tel. 987 618 532/ 679 154 383; alberguesanjavier [at] hotmail [dot] com) is very near the cathedral, but I walked all over town before finding it! It’s on the street off the small parking lot to the left of the cathedral. No. of Beds: 110 beds in a large dorm with lots of wooden posts and beams, which somehow adds warmth to all those the bunkbeds. Washrooms: One has a few showerstalls, and another has a few toilets. Courtyard: Yes, a pretty little courtyard where you can line-dry laundry. Bonus: Pilgrims staying at San Javier get a coupon for 2 euros off the pilgrims’ menu at the stunning Hotel Gaudi (that means that guests of the hotel actually pay 2 euros more for the pilgrims’ menu than guests of the hostel do! 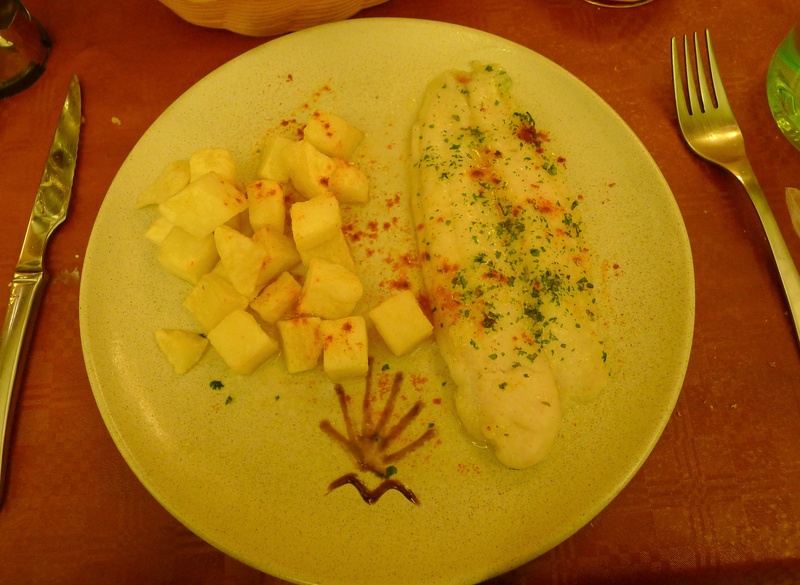 The Hotel Gaudi menu is 14 euros regularly). 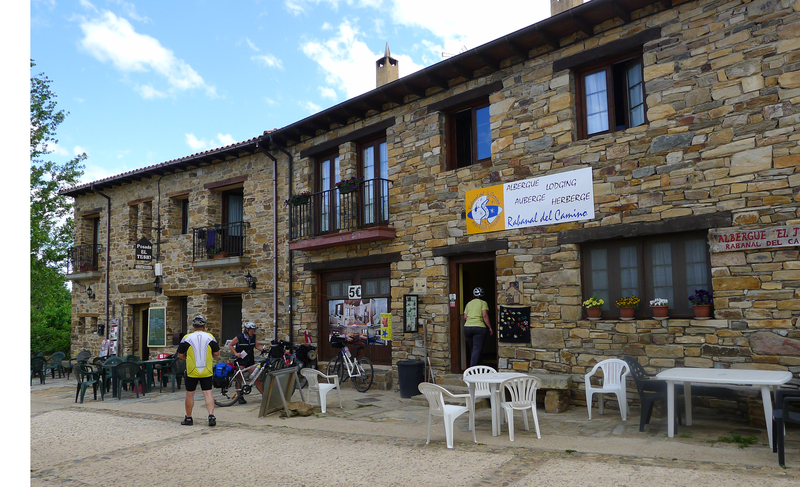 Albergue: Rabanal la Senda is the first stone building on the left when you walk into the village, right on the Camino. No. of beds: I can’t remember how many beds there are, but there are 3 types of rooms on the 2 floors of this converted house: the more beds per room, the cheaper the rate. Note that the two smaller rooms upstairs have fewer beds (3 or 4 bunkbeds) because the rooms are sooo small. The two 5-bunkbed rooms on the main floor are nice and roomy. Blankets: Yes. Blankets are a must here, with the stone interior walls of the downstairs dorms making the rooms freezing at night. Or at least I was freezing, understandable as there was frost on the grass outside in the morning. Cyclists: Cyclists are welcome, and you can see some in the photo above! Bike storage is in a shelter across the road. Washrooms: There’s a modern, spacious unisex washroom on the main floor (complete with shower, toilet and sink). Two less modern, unisex washrooms are upstairs, but be warned: they’re open to each other via a gap at the top of the dividing wall. Vibe: Cosy like a home, with 2 dorms and a washroom downstairs and 2 small dorms, 2 washrooms, a kitchen and a dining area upstairs. The friendly guy who runs it speaks “a little English” (really! he has a sign on the door that says that) and lives in another town. The large dining room has three wooden tables topped with tablecloths and wildflowers, and a fireplace, a coin-operated computer and a massage chair. The quaint kitchen is just big enough to squeeze 3 people in it, and overlooks the yard across the road. Bonus: Rabanal is small, but there are a couple of restaurants (one’s beside the albergue) and a tiny grocery (it closes for siesta). This albergue is homey, with the cosy kitchen and dining area upstairs and the patio tables out front, where you can sit and watch the pilgrims walk by. It’s also a bike-friendly albergue, with a large wooden bike shelter/laundry room next to the picnic area, chaise longues and laundry line on the lawn across the road. My friend and I bought foodstuff at the grocery, cooked up some pasta in the kitchen, then ate it at the picnic table outside, enjoying the last rays before sunset. I didn’t stay in Foncebadón, as it was too close to Rabanal (the 5.6 kilometre steep climb up Montes de León from Rabanal makes it feel like it’s more than that!). Most of Foncebadon is in ruins and looks like a ghost town (notice the rubble in the photo), but there are a couple of hippie albergues/restaurants that bring it to life. 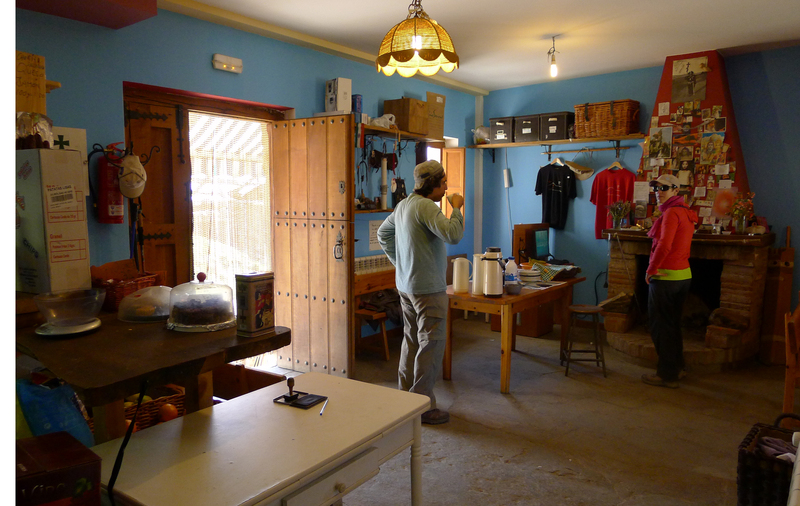 I stopped at this café for a snack (think homemade energy bars and self-serve coffee), and discovered the owners run an albergue in the back! Sweet! Albergue: You can’t miss Albergue Monte Irago. 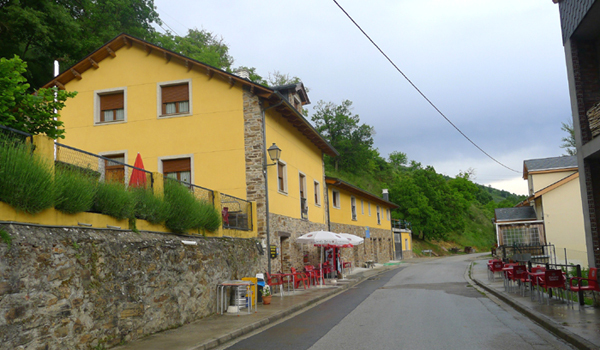 There’s only one road – the Camino – going through the village, and the albergue was the first intact building we came upon on the left side of the road. The owners are hoping to rebuild Foncebadón, so here’s hoping! Washrooms: As I didn’t stay here, I’m not sure how many there are. Vibe: The hippie vibe of the café extends to the albergue! As soon as I found out they had accommodation, I so wished I’d stayed here instead of Rabanal, just because the vibe was so funky and French-like. Bonus: The cafe is so warm and friendly and kinda French granola, and the owners were the same – they were joking around with me the entire time I was there, letting me stamp my pilgrims’ passport myself and tossing me a rag to wipe up the coffee I’d spilled, even teasing that I was on staff! Again, I didn’t stay in Acebo, but it was such a pretty little village, all done up in flowers, and one albergue even had chaise longues on a pretty patio. I was tempted to stay here had my feet needed to stop. Alas, I only took a washroom and water break in Acebo, resting at La Posado del Pelegrino, the first bar I came across. 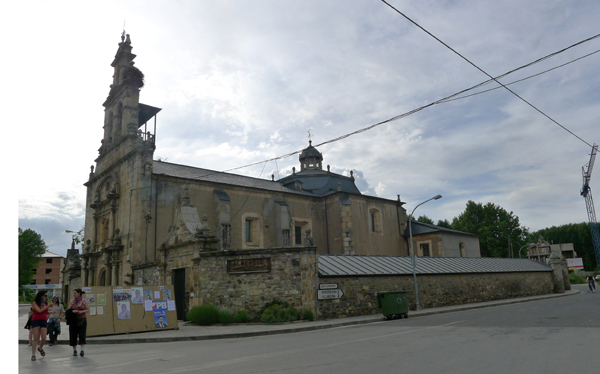 Unfortunately, I don’t have a photo of the albergue, as my camera battery died and I couldn’t charge it, since I’d forgotten my plug adapter in the wall at San Javier, back in Astorga. This village is near the base of the mountain, which means the town is on a slope. There’s no store, and the 1 restaurant is at the far end of town, which means the walk back to the albergue is uphill. Albergue: Albergue de Riego de Ambros is a nondescript building with giant wooden doors, on the main road and to the left of the fountain. No. of beds: 50. There are 2 bunkbeds in each little cubby room, with sliding doors at both ends of the room for privacy, plus shelves (both inside and outside the room). Washrooms: At the back of the sleeping area, there are mens’ and a women’s washrooms, but they only have one toilet (with a door), one shower (closed off) and one sink in each. Despite the lack of facilities and given that 50 pilgrims could stay here, there never was a line for the washrooms! Backyard: There’s a pretty treed yard that gets lots of sun, perfect for stretching out on the grass or line-drying your laundry at the sink outside. A few tables and chairs are clustered on a small patio off the kitchen/dining area, which is well equipped with spices, olive oil and sea salt. Given the nice setting, it’s a shame there’s no store in town, but if you’ve foodstuff in your pack, it’d be a cosy albergue to cook dinner and lounge in the dining area or picnic outside in the sun. Vibe: The sleeping area is rather modern and almost Scandinavian in feel, with the wooden sliding doors and cubbies. There’s a spot at the front of the sleeping area for everyone to leave their boots or shoes, and some comfy clubchairs by the floor-to-ceiling windows. The kitchen and dining area, by contrast, are more rustic, and the treed courtyard is charming. Curfew: 10:30 p.m. Later than most albergues, but there’s nothing much to do in this village. I climbed up on the stone wall in the backyard to watch the sun set around 10 p.m.; most pilgrims were asleep before 9 p.m. Bonus: This albergue gets lots of light thanks to the floor-to-ceiling windows and sliding glass doors. I really wish my camera battery hadn’t died and I hadn’t stupidly left my adapter at the hostel in Astorga, because Molinaseca is one seriously picturesque town. If I’d been able to take a picture as I crossed the stone bridge into town, I swear I’d have turned it into a postcard. 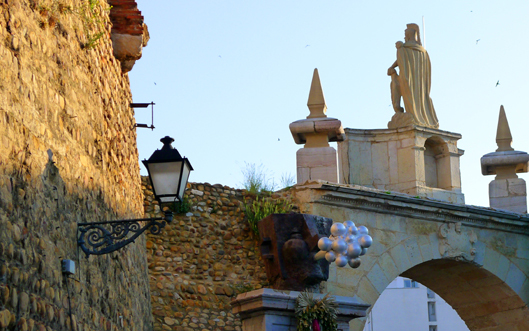 At the base of Montes de León, Molinaseca is a sight for sore eyes and feet, resembling a Swiss village, albeit with some touristy shops and lots of restaurants/cafes and grocery stores. Almost every pilgrim stops at the first café and languidly savours a café con leche and croissant on the large patio beside the Meruelo River. Though it’s not even 5 kilometres from Riego de Ambros, I was mighty tempted to call it a short day and just chill here. Hotel: I’m including Hotel Los Templarios (calle Flórez Osorio 3; tel. 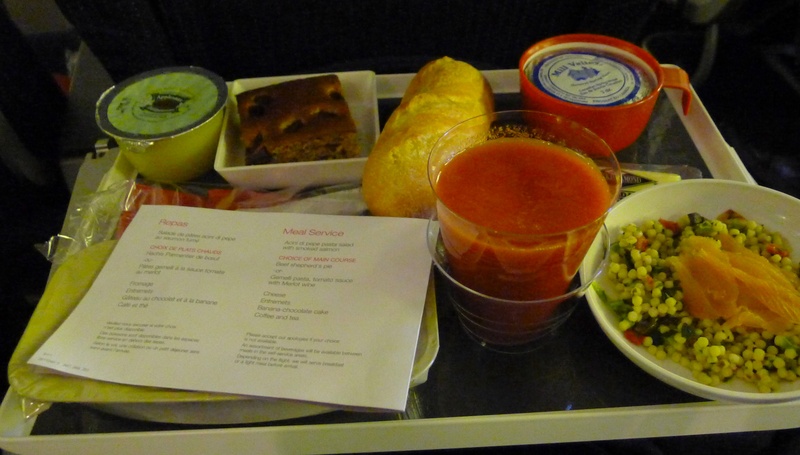 987 411 484) because sometimes you just want to splurge on a good night’s sleep at a hotel. No. of beds: Aha! We ditched the dorm for one night, choosing to stay in comfy beds and enjoy hot showers/baths and, better yet, a snore-free sleep! Blankets: You betcha! I was toasty under the covers. Washrooms: Of course! A blissful tub full of hot water, real towels, and a toilet that was just steps from my bed was well worth the extra euros. Vibe: It’s not high end, but it was clean and comfy, and as you can see from the photos, there’s a juliet balcony and glass doors – and they overlook some rooftops and the clock tower. There are 2 computers off the lobby, but the connection is seriously slow. Curfew: Of course not! And so I stayed out late to take pics. Cost: 60 € for a room with 2 double beds. Bonus: As opposed to the lone albergue, which is in a parking lot on the outskirts of the city, Los Templarios is just off the main square. As you walk toward the tower and you get to this spot, look down the alley to your left, and you’ll see the hotel’s flags. Not far from the Templar Castle, the hotel is also close to restaurants, supermarkets, boutiques, a park, 2 outdoor outfitters (I bought my coveted Smartwool long-sleeve shirt at the smaller one, Fitzroy), and a little small-appliances shop that carries plug adapters for about 1,5 euros apiece! 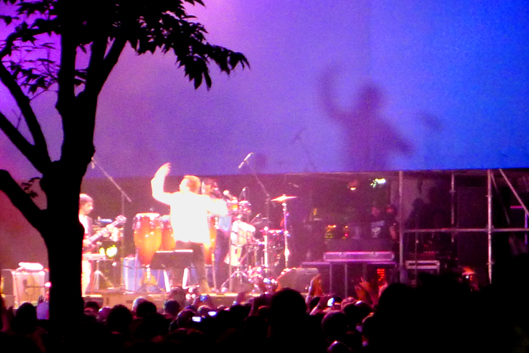 Hence, I was able to charge my battery and take pics again! Woohoo! 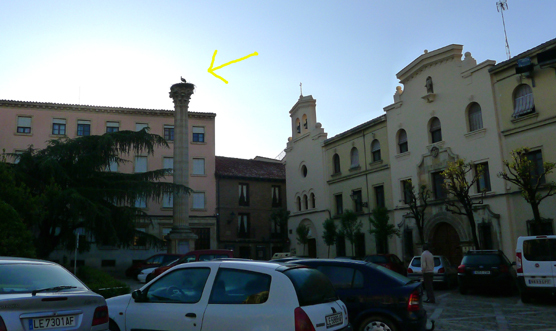 This is the first part of a 5-part series on albergues between León and Santiago. Read Part 2 here! OK, I admit it. 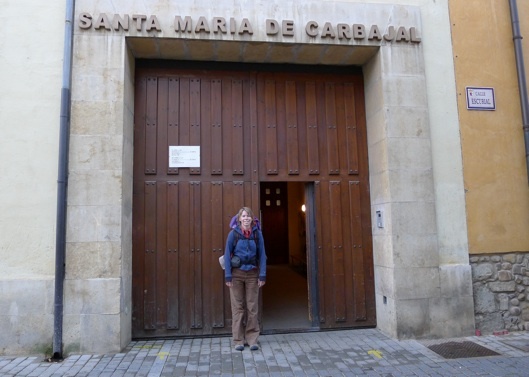 My first full day on the Camino de Santiago was a cheat day. After spending an entire day flying from Toronto to Paris to Madrid and then bussing it 5 hours from Madrid to León, I was knackered on arrival, so relaxing my first night was a must. But my friend Leanne, whom I’d flown there to meet, had the brilliant idea of taking the bus 50 kilometres from León to Astorga, saving us a day of walking and giving me a day to get over my jetlag. Now, believe me when I say I was keen on setting out on foot on Day 2, as I was determined to do the full 300 kilometres from León to Santiago de Compostela. But I also was wiped from the flights and bus ride, so I wasn’t about to fight Leanne about not walking outta León à pied. Despite deeming it our lazy day, we still were in pilgrim mode, waking up at the crack of dawn. LESSON 2: Whether you want to or not, you’ll wake up before sunrise, when all the other pilgrims in your dorm stop snoring and start rustling their sleeping bags, getting dressed and chatting to their friends. If you’re blessed with super-awesome earplugs, you might block out the noise enough so you can sleep in till 7 or 7:30 a.m. But by 8 a.m., the albergue manager will flick the lights on and come barging through your dorm yelling “Buen Camino!” to signal it’s time you hit the road! The lovely manager at the Albergue del Monasterio de las Benedictinas (Santa Maria de Carabajal) did that around 6 a.m.! By then, most of the 28-some people in my mixed dorm had fled to the trail, leaving me and Leanne behind to eat our humble breakfast of yogurt, milk and leftover snacks from my flights. 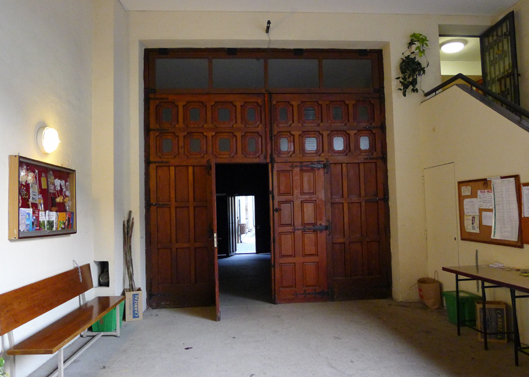 It gave me time to snap pics of the convent entry, mainly the bin of walking sticks (an albergue entryway staple) and the heavy wood doors. 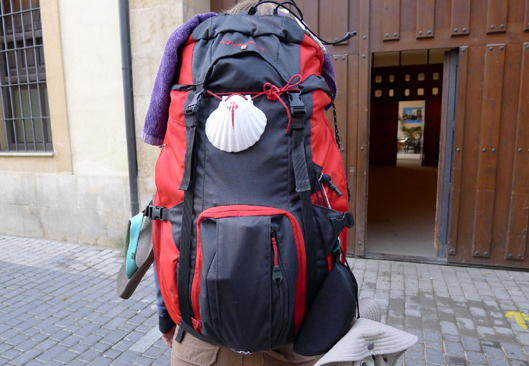 Day 2 being my first real Camino day, I couldn’t resist a shot of Leanne’s backpack, complete with requisite pilgrim’s shell featuring the cross of St. James. 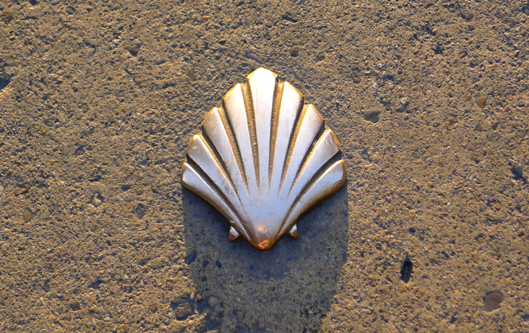 At the time, I was a tad jealous that I didn’t have that same shell, but it’s so ubiquitous on the Camino, it has a massmarket feel to it and I’m glad I waited to find the right shell for me. And I just noticed now that there’s a yellow Camino arrow on the ground, pointing to the convent door (see photo above)! In fact, there are 2 arrows (see below), just to make sure pilgrims don’t walk right past the Nuns’ Hostel. Not spotting the yellow arrows was something I did quite well those first few days on the Camino. You’d think, because they’re everywhere, it’s something you’d notice upon first glance. But it really does take some getting used to, the looking for the yellow arrows that direct you where to walk. 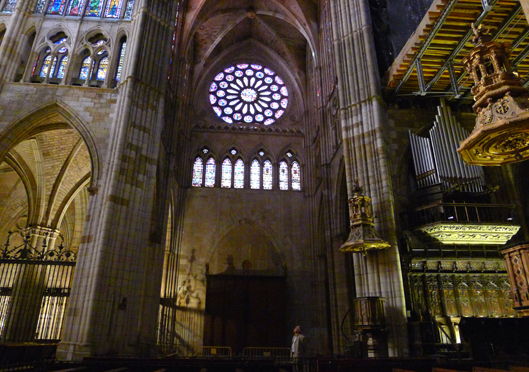 LESSON 3: The Camino is all about intuition. Whether it’s learning to spot the yellow arrows or understanding the trail so you know where to go even when there isn’t an arrow in sight, walking the Camino is about being in tune with your surroundings. It’s finding your own way of walking – how fast or slow your pace is, how often and when and where you take breaks (and why! it could be just to take in the views from a mountaintop! 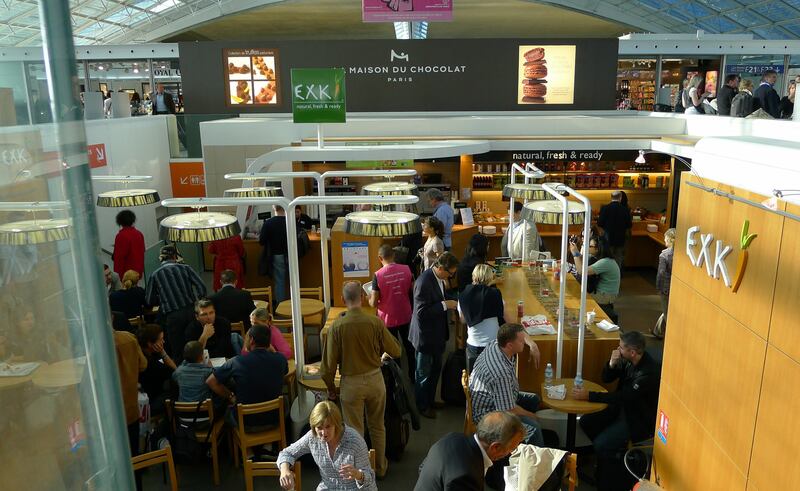 ), which towns or villages you want to sleep in, where and what you want to eat. There’s a common saying among pilgrims: everyone has their own way of walking. Some people think pilgrims need to suffer a bit – painful blistered feet will attest to that. Others think that pilgrims walk for many reasons and each has their own way, and lest you judge the pilgrim who stays in fancy hotels or takes cabs or buses or has their bags shuttled from hostel to hostel. When I started out, I didn’t think much about either camp. I was there to walk with a friend, experience a different culture and landscape, and take a pause from everyday life. So my first full day on the Camino was indeed a lazy day, and it began with a stroll from the convent to León’s famous cathedral. Steps from the convent is this little square. The night before, it was bustling with the dinner crowd chatting away at cafe tables in spite of the light rain. 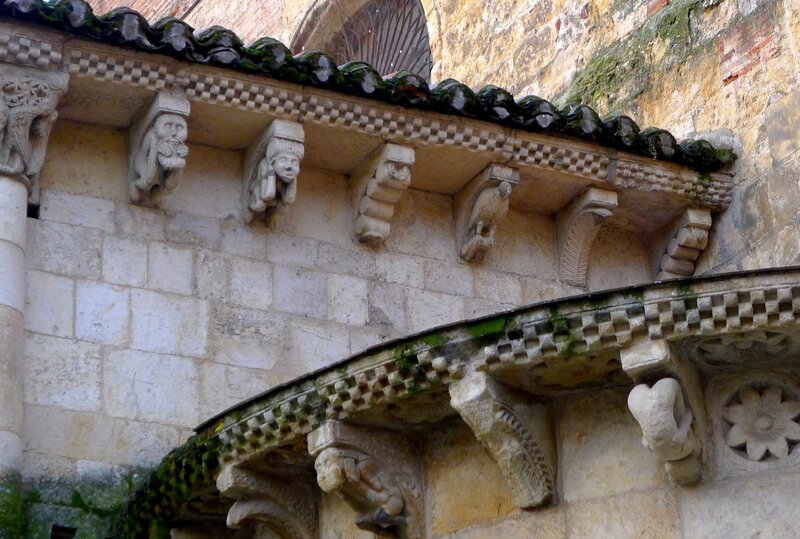 Weathered gargoyles, still intricately detailed despite their decay, embellished the church exterior. 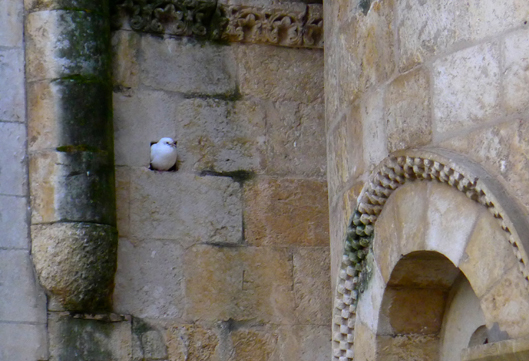 Playing peekaboo: a pigeon who stuffed himself into a wee opening in the church wall! 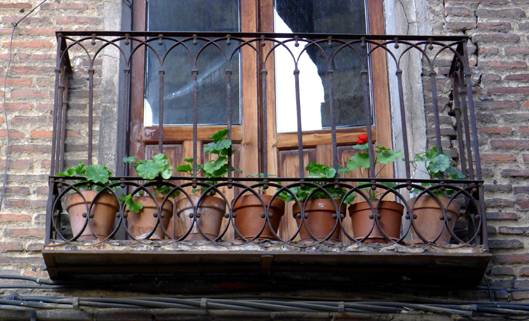 A wrought-iron juliet balcony filled with red geraniums – what’s more Mediterranean than that? 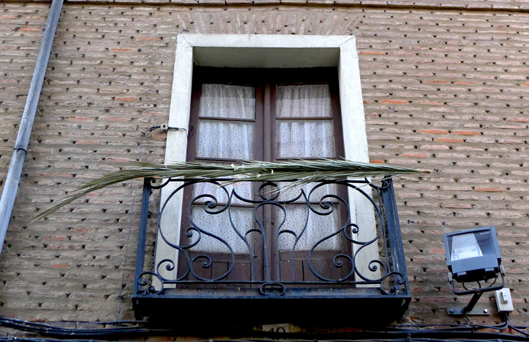 A lingering symbol from Palm Sunday, dried palm leaves strewn across balconies was a common sight in León in May. Up until that morning, I hadn’t really thought of myself as a pilgrim, and even though I’d dined and shared a dorm with pilgrims, I hadn’t seen one (aside from Leanne) in full form. 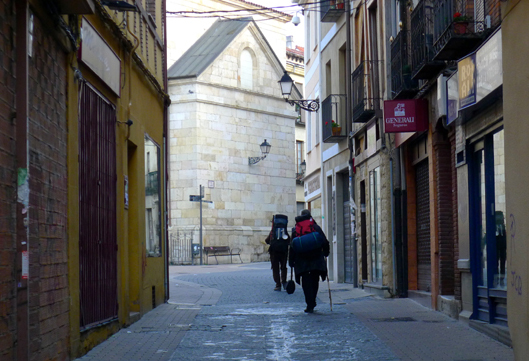 By 8 a.m., there were still some stragglers making their way through León, and so I had my first glimpse of pilgrims. As we approached the cathedral, I spotted my first shells! 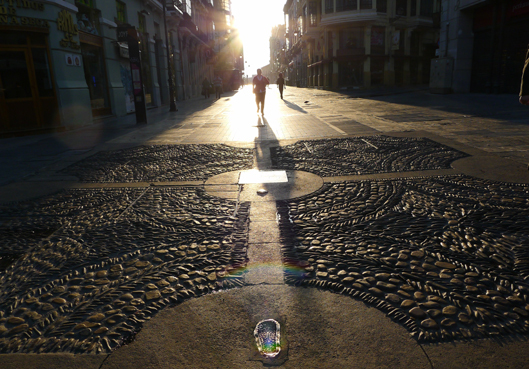 There’s a pedestrian-only street in León that’s embedded with bronze shells, so pilgrims making their way to the cathedral walk over the pilgrims’ symbol. The pedestrian street also features bronze pilgrims’ footprints surrounded by stone mosaics. I was sincerely stunned by the sublime sight of this footprint as I took my first steps as a pilgrim. The cathedral was still closed when we got there, so we wandered a bit more, admiring the unusual street art by this stone archway. 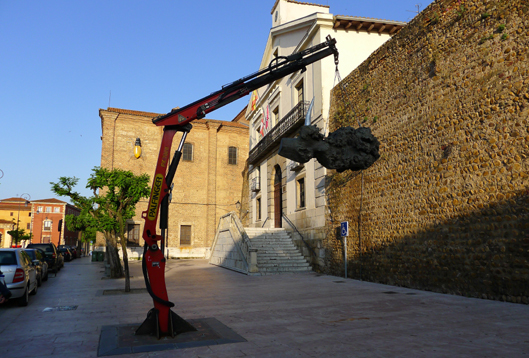 I also saw my first giant stork, which I actually thought was art because it was sooo large! Those storks are everywhere on this stretch of the Camino, building their ginormous nests on church steeples. I honestly couldn’t stop taking pictures of each stork I saw – that’s how awed I was by their size. And when we finally got back round to cathedral, I actually forgot to take pictures! 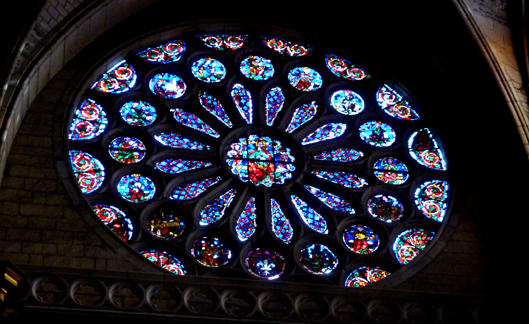 I think I wasn’t quite clueing in to the age of the cathedral, but I was awestruck by the gothic architecture and 1,800-square metres of stained glass windows. After poking around the cathedral, we had our third breakfast of the day. Our first was at the albergue, our second was on a bench beside the cathedral, when we were waiting for it to open, and our third was at a café. This habit of having multiple breakfasts is a Camino thing, as pilgrims start out so early and need lots of fuel, plus it’s always a treat to chill at a café. But on our way to the café, we spotted this awesome bike share service. It’s funny, but I was more floored by the bikes than I was by the cathedral. I honestly don’t know much about the bike share program, except we found out from a gentleman there that it’s free and only for residents of that neighbourhood. Free bike share! 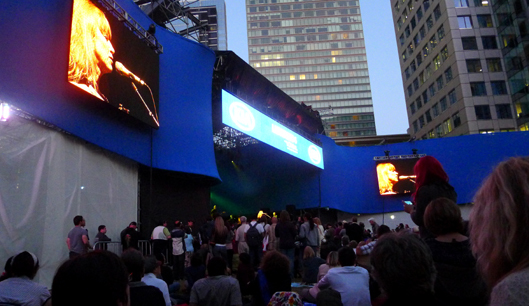 We so need that in Toronto! So much activity, and it was only about 10:30 a.m.! For a lazy day, we sure packed in a lot in the morning. After having our croissants and cafe con leche at a cafe, we headed to the bus station to catch a bus to Astorga. I sure appreciated the nap on the bus, and woke up ready to explore the city known for it’s Gaudi architecture as much as it is for its macarons: Astorga! For that, you must read on! Happy belated May Day! 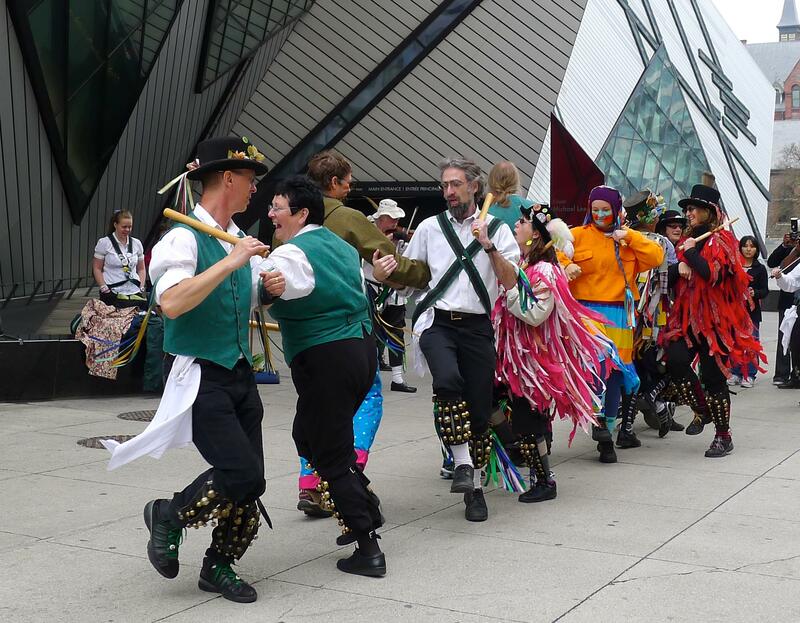 Every May 1, or May Day, Morris dancers bring the spring celebration to the streets of Toronto, usually in front of the Royal Ontario Museum (ROM), as these delightful dancers did yesterday afternoon. I came upon them as I was walking along Bloor Street, having just finished watching Nina Conti’s Her Master’s Voice at Hot Docs, an international documentary film fest I volunteer at. 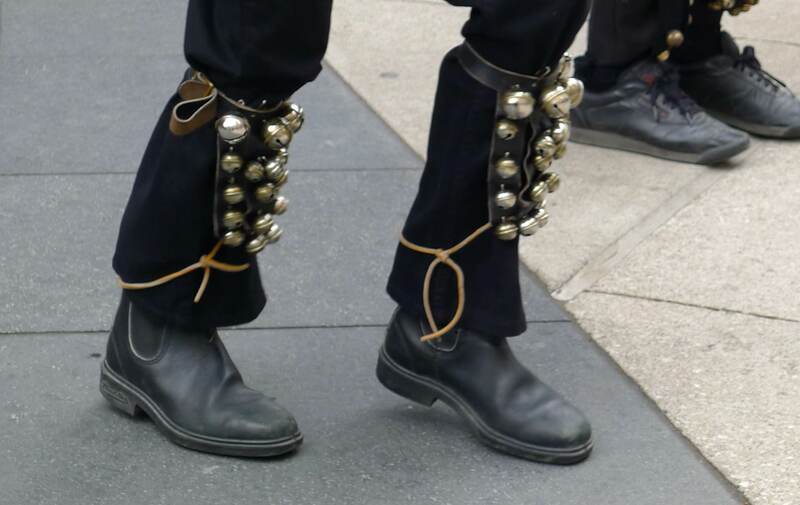 Crossing the street was a man with a big bass drum strapped to his chest, colourful streamers billowing from his body, and rows of brass bells decorating his shins (check him out below!). Bemused at the thought that hoards of oddly dressed one-man bands were congregating out front of the ROM, I continued on my way home, desperate to nap between films. But when I spied a few more ribbon-bedecked people merrily marching their way along Bloor, I just had to ask one what was going on. 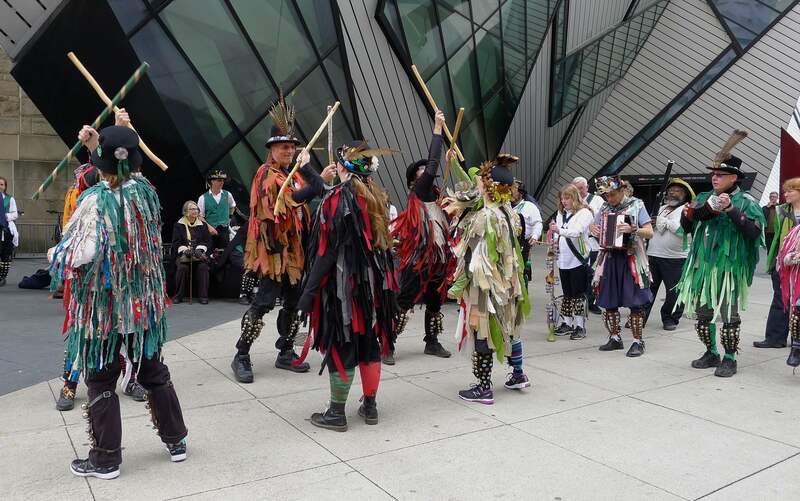 Morris dancers! 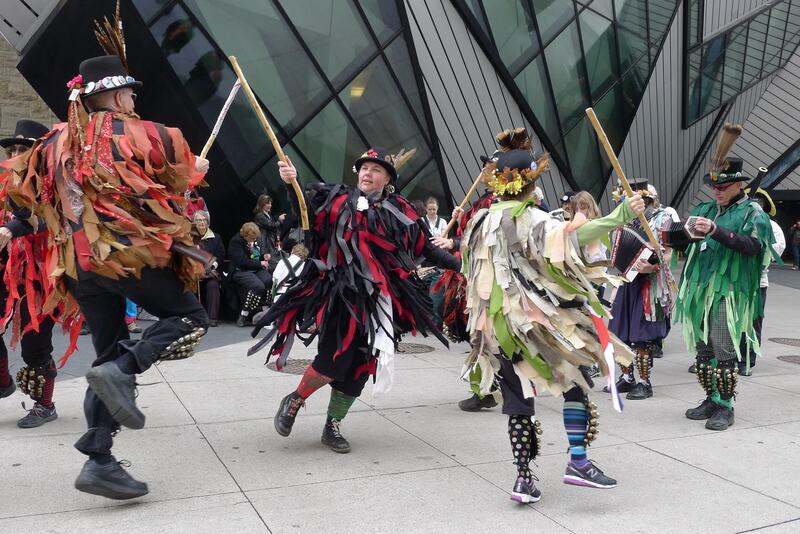 They were Morris dancers! In truth, that meant nothing to me when she said it, as I’d no clue what Morris dancers are. 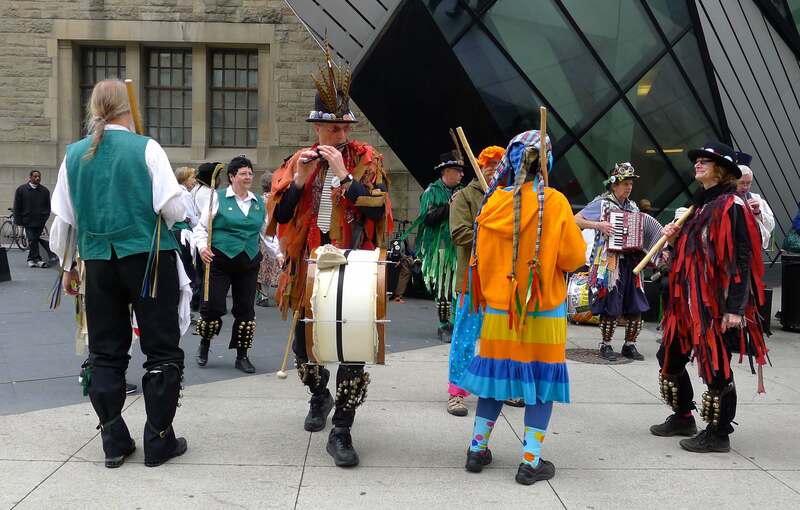 After questioning a performer, I learned that Morris dancing is a traditional English folk dance based on stepping (that was obvious from watching them) and performed throughout the month of May. The dancers carry white handkerchiefs and wooden sticks in their hands and jingle bells (bell pads) on their legs as they step and hop about. Dressed in torn strips of vibrantly hued fabric outfits called tatter jackets, these dancers were delightfully twirling around one another and whacking their sticks in time to the tunes played by their wee band: two drummers, two accordionists, an oboeist and even a girl skilled with an ugly stick (a traditional Newfoundland instrument made from an old mop handle, bottle caps and bells). The colourful costumes really were a sight to behold and are historically based on the part of England the dancers are from. This one (below) looks like it’s made from recycled ties and shirts. 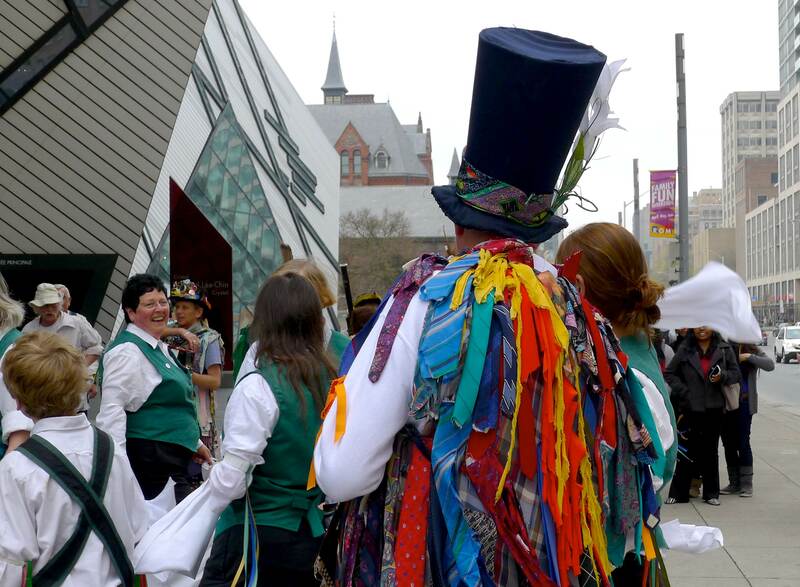 The dancers before the tatter-jacket-wearing group were still vibrantly hued, but a tad more subdued in traditional green vests or crossed baldrics (shoulder belts), crisp white shirts and black pants. They too were dancing up a storm with the wooden sticks, white kerchiefs and jingley bells! Their dances were much more like the stepping I’m familiar with, with the dancers aligned in rows and performing in pairs. It was such a fun and fabulous sight to come across, seemingly random but not random at all. 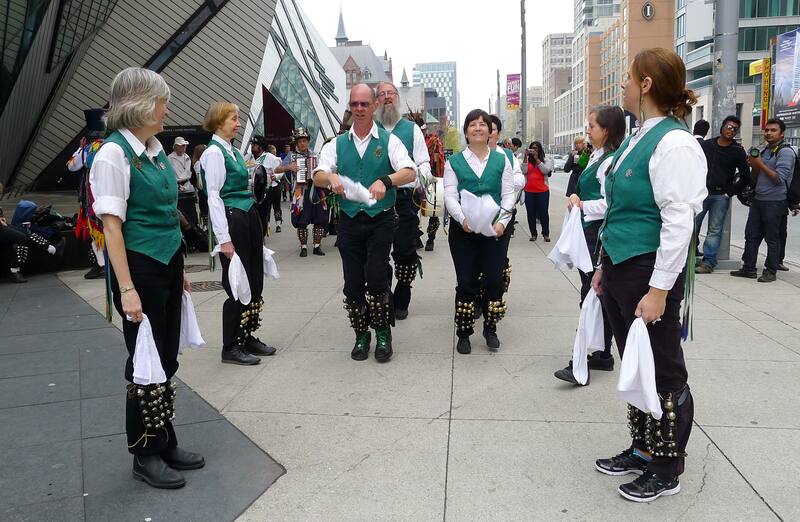 In fact, various groups of Morris dancers can be spotted performing all around Toronto in spring and fall, particularly on May Day (as seen here) and on Labour Day. They practice year-round for these performances, which are akin to flashmobs, given that they came together unannounced and performed for about half an hour before just as promptly dispersing. Abd when they were done dancing, traces of them walking in front of the Crystal was all that was left of them. I’m going to keep an eye out for these mischievous musicians and dancers over the next few months. What a wonderful way to start the merry month of May (my birthday month, of course)! Out bike riding the other day, I came upon this mural featuring the final words of the Honourable Jack Layton’s letter to Canadians, written just hours before the leader of the New Democratic Party and Official Opposition passed away of cancer last summer. The mural wraps around part of a Toronto playground tucked away in a quiet neighbourhood not far from the bustle of Queen Street West and Ossington Avenue. Jack Layton’s final words are words to live by and continue to inspire all Canadians today. 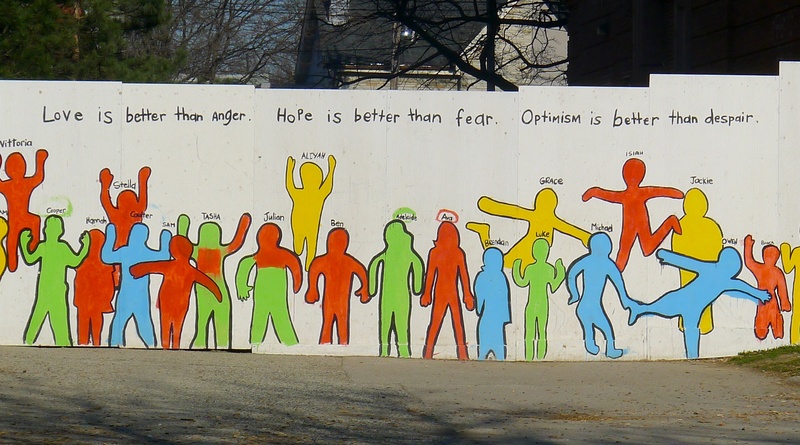 When I saw this mural, I almost walked by without noticing the quote, but when I recognized it, I sat down and just paused, soaking in the vision of this community of children full of love, hope and optimism, working and playing together to create a better Canada and a better world. Because I do believe that’s possible. And the act of filling a public playground with such an optimistic quote truly was inspiring.